For me, cooking classes are the perfect way to introduce my students to new dishes. And vice versa, to learn about new dishes myself too! 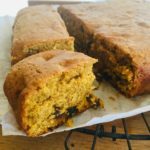 That’s how this Pumpkin Bread with Sweetened Condensed Milk came into my kitchen.